Start by heating a pan of water until boiling. 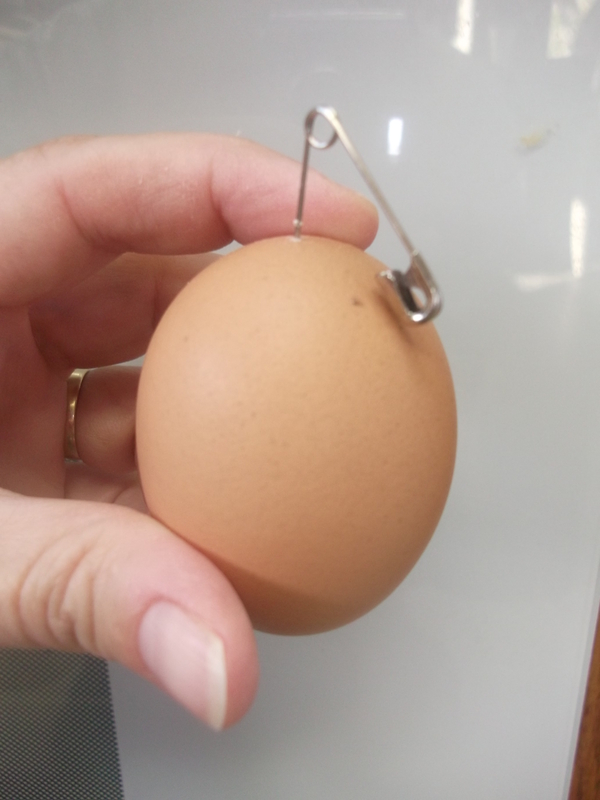 While the water is heating, take a safety pin or needle and carefully poke a hole in the larger end of the egg. I assume this is the bottom, but I’m not good with things like that, since I can’t stand them up: my eggs lie on their sides if I’m lucky, and roll off the counter if I’m not. But if you look closely, you’ll see that one end of the egg is wider, and that’s the end to poke. There’s a little gap (a millimeter or two) between the shell and the membrane on that end, so don’t poke too deep or you’ll pierce the membrane and have egg white leaking out. Poking this hole will allow the pressure to be released from the egg when it hits the boiling water. Without this hole, the pressure can build up and crack the egg shell. Gently lower each pierced egg into the boiling water, and set the timer for 15 minutes. You can lower the heat to a more gentle boil, but I don’t find that’s really necessary unless your water is boiling over. As for the 15 minutes, that seems to be the best time frame for fully cooking any egg, including extra large eggs that are still cold from the refrigerator. Feel free to experiment with shorter cooking times (say, 10-12 minutes) for smaller eggs. While the eggs are boiling, prepare a bowl of cold water and ice cubes. There is no exact measurement to follow, but the bowl should be about the size of the pan, so you know the eggs will fit. Add enough ice that the hot eggs won’t melt it right away. 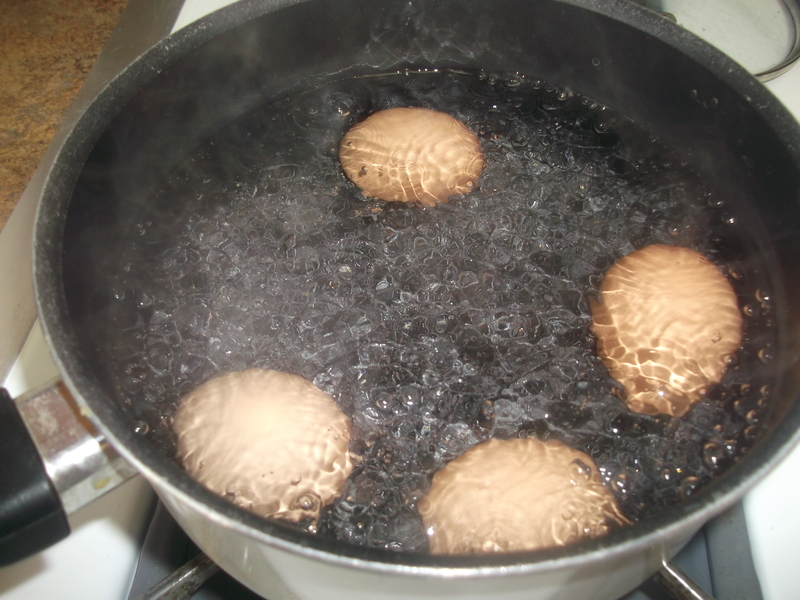 When the timer goes off, remove each egg from the boiling water and drop it into the ice water. Now here’s the secret trick to avoiding the ring: smash the eggs a little bit against the side of the bowl. That’s right, break the shells a little, then submerge them in the ice water. From what I remember, these crushed holes will allow the sulfur inside to escape into the ice water, and that this gas is what would otherwise cause the ring. I don’t remember the science behind it; I just know it works. After about 15 minutes in the water, take them out and either peel ‘n eat them right away or store them in the refrigerator (put them in a plastic bag, so the exposed egg white on the smashed side doesn’t dry out and get rubbery). 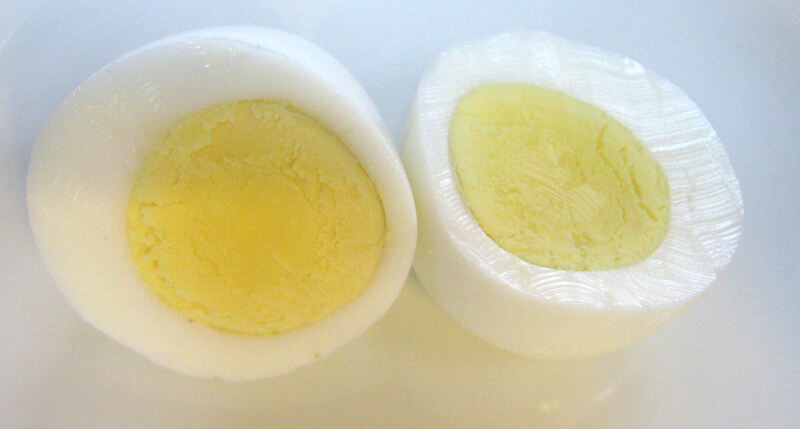 Enjoy your ring-free hard boiled eggs! P.S. 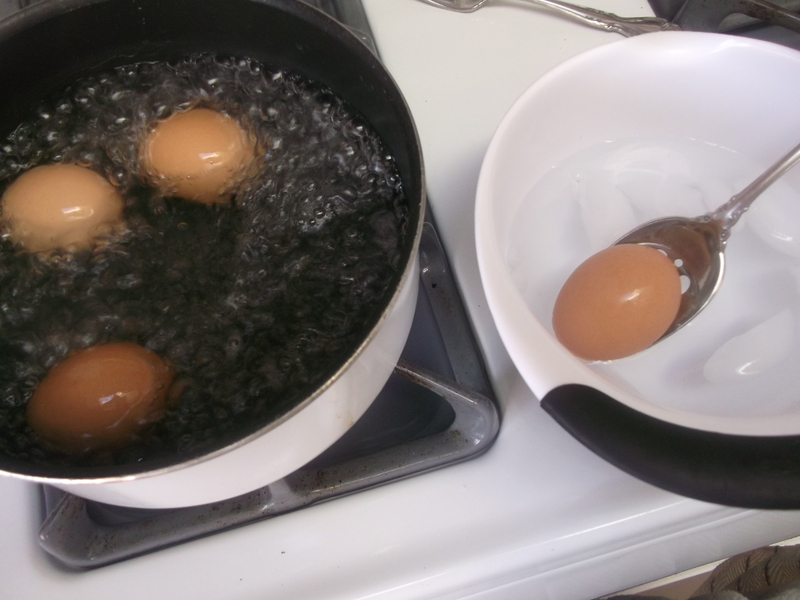 To make the eggs easier to peel, peel them under running water. I’ve used their version of the recipe for years now, but I’m going to try your shell smashing trick and see if that makes it work even better! I loved the Exploratorium when I visited it years ago. Didn’t even know they had a Science of Cooking site. Thanks for the link! Okay, just checking to make sure the ring wasn’t going to kill anyone in my house! Maybe I’ve been lucky in the past, but my yolks were always yellow with no ring; however, these went straight from the stove, to a covered bowl, and then the fridge, which I don’t usually do (nor do I usually do extensive run-on sentences ;)). Thanks! You saved me a trip to Walmart where I was going to insist on new eggs! Another method for perfect eggs is: Steam the eggs in a vegetable steamer set over boiling water for 12 or so minutes – depending on the size of the egg. 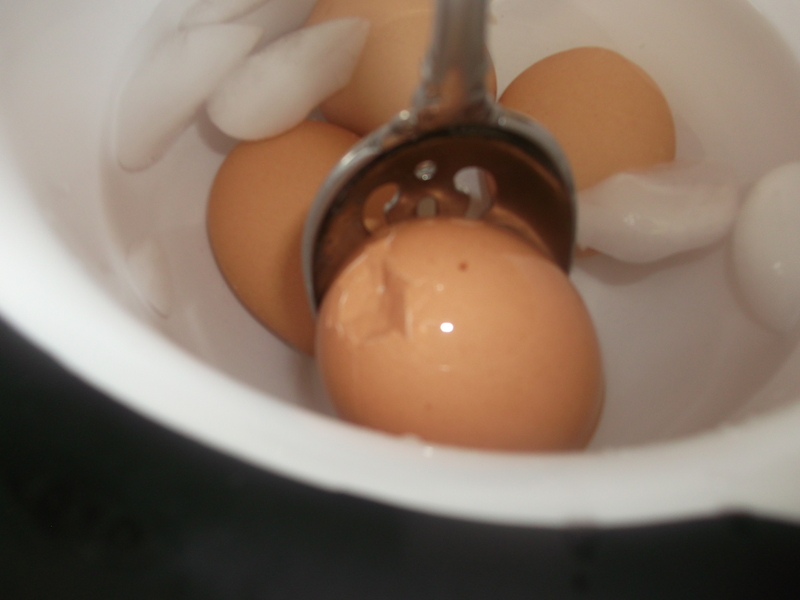 Then place the eggs in ice water and refrigerate until use. 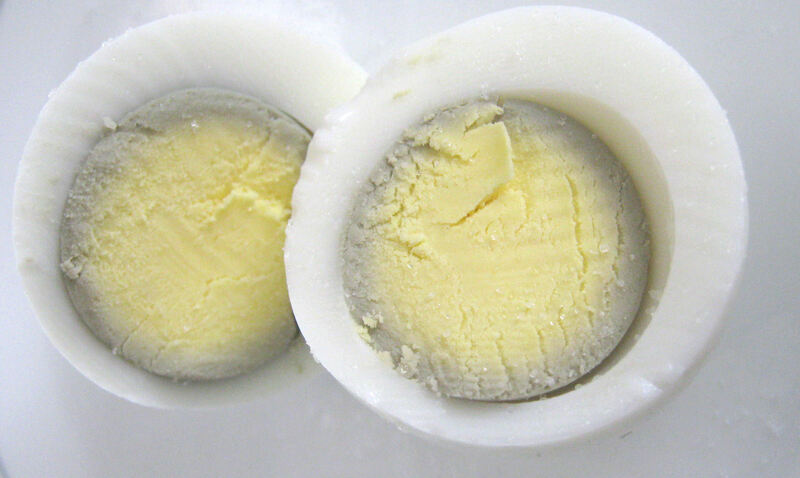 Even fresh eggs peel easily. Never tried this method – the way I found that works great for me now is to drop the eggs in and let the water boil with them in there. As soon as the water is boiling, remove pot from heat – but cover – and let sit for maybe 10 minutes or so. The come out moist and bright yellow.